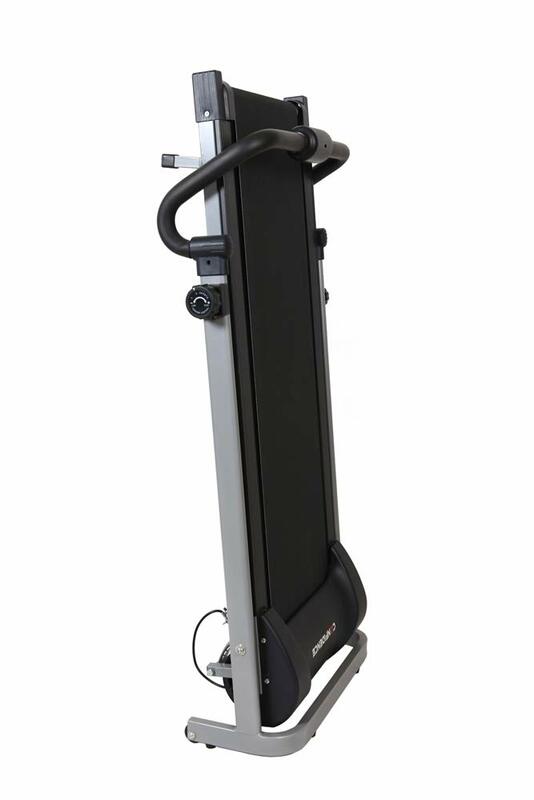 The compact magnetic manual treadmill by Confidence Fitness is a basic but a robust and durable model with a modern design and a small LCD display panel. It is rated 3.9 out of 5 stars by 161 customers. You can get it with or without an equipment mat from different sellers and please check the price difference via Amazon.com. This compact manual treadmill comes with a magnetic resistance that makes it run smoothly and quietly. You can adjust it to 8 different levels through the tension dial on the right hand side. There is a 5% fixed gentle incline that can’t be made flat or adjusted. The multifunctional LCD display panel shows the standard stats like calories, speed, time, distance, as well as scan and ODOmeter that shows the mileage since the first time this treadmill was used. 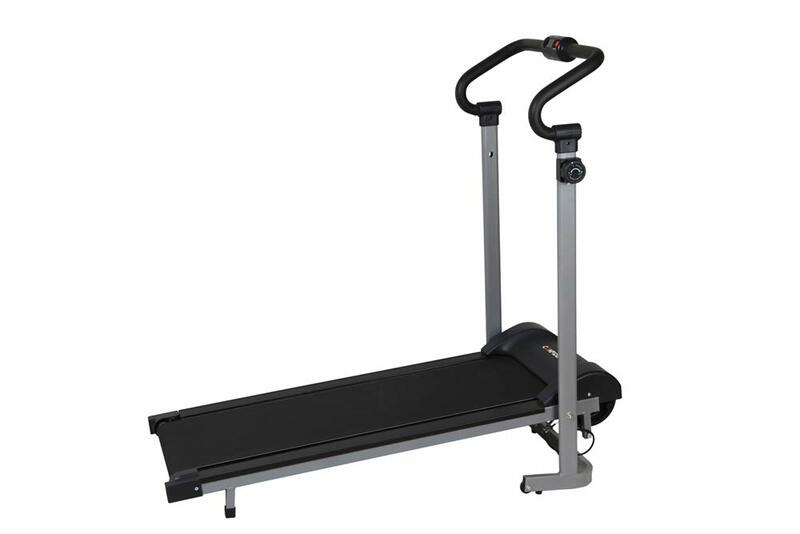 Confidence Manual Treadmill has a small footprint of 19.1 x 47.2 inches with a runway of 15 x 40.2 inches. You can move it easily from room to room within your house on its integrated wheels after folding it easily with the simple locking pin mechanism. It measures only 48 x 7.9 inches as folded. People that are up to 220 pounds or roughly 100kg of weight can use it comfortably. The package weighs 46.9 pounds and measures 52.1 x 24.4 x 9.3 inches. You’re getting quite a good value for the money from this good quality manual treadmill that will let you exercise whenever you want in the comfort of your home. A couple of people had a problem with centering the running belt and there is a Youtube video for troubleshooting this problem with the link on the Amazon page. You simply need to tighten the screw on the side where the belt has moved by set turns at a time to adjust it. The gentle 10% incline on the belt makes you workout a little more challenging and lets you burn more calories and fat in the same amount of time. You can make it flat by putting wood blocks underneath the rear belt. In the incline position it gives you a pretty tough workout. You’ll start breathing heavily and sweating in just a matter of minutes even if you’re pretty fit and used to working out on treadmills. And this means your heart rate is going up and you are burning calories. You can hold the arms when you need to as they feel comfortable. This model doesn’t require much maintenance except for adding a bit of lubricant underneath the belt- in the center and on the sides. Please check the user manual for the accurate instructions. When you fold this treadmill the thickest part will be about 9 inches and see if that would fit under your bed or in your closet. After being used for a while the frame may get loose and make noise, and you may want to tighten the screws with the wrench provided. The handles are a must for the proper operation and use of this treadmill. You can not remove them and if you did you would encounter stability issues. You can actually get a better workout on a decent and efficient treadmill such as this one than on an electric treadmill as you simply your own body to push the belt and walk, jog or run. It doesn’t require much assembly and is not hard to do so when you follow the instructions. You can use it every day without any problems and is overall very much worth the money. You’ll get a warranty of 12 months by the manufacturer and get help free of charge (if not because of user error) if anything goes wrong within the first year.